Il 332� Reggimento di Fanteria, sotto il comando del Colonnello William Wallace, � stata l'unica unit� americana a combattere sul fronte italiano. La storia del 332� Reggimento di Fanteria inizia col la sua istitutuzione il 30 Agosto 1917 a Campo Sherman, Ohio, e assegnamento alla 83a Divisione. Il reggimento comprende un vasto numero di uomini dall'Ohio, includendone molti da Cleveland, Akron, e Youngstown (compreso un buon numero di emigrati italiani, n.d.r). Il 28 Luglio del 1918, il 332� arriva a Milano. In Ottobre, il reparto viene inquadrato con il contingente britannico nella X Armata e succesivamente con la III Armata del Regio Esercito Italiano. Verso la fine di Ottobre, Wallace riceve ordini di muovere il suo reggimento verso il fronte. The 332nd Infantry Regiment, under the command of Colonel William Wallace, was the only American unit to serve on the Italian Front. The history of the 332nd Infantry commenced with its organization on 30 August 1917 at Camp Sherman, Ohio, and assignment to the 83rd Division. The regiment was comprised of large numbers of men from Ohio, including many from Cleveland, Akron, and Youngstown. 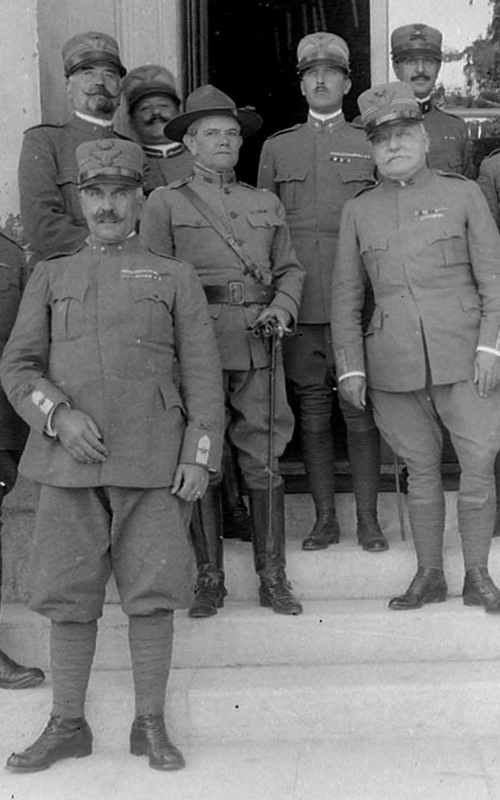 At 28 July 1918, the 332nd arrived in Milan. In October, Colonel Wallace soon learned that the 332nd would be assigned to the Italian 31st Division, British 10th Army. On the 28th, Wallace received orders to begin marching his regiment to the front.